During my time with Darksiders 3, I couldn’t help but constantly compare it to the Dark Souls games. Both now share a lot more beyond the mere word “Dark” in their titles. From challenging combat, an interconnected world and collection of souls, the third entry seems to have drawn an ample amount of inspiration from the Souls series. 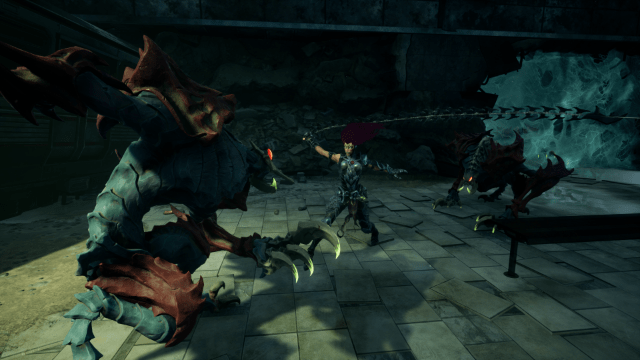 Even certain boss battles summon a sense of deja vu, but with all these similarities, does Darksiders 3 stand on its own and, more importantly, serve as a worthy sequel to its predecessors? Though there are benefits to being familiar with the prior titles, it is not mandatory and some amount of backstory is provided. 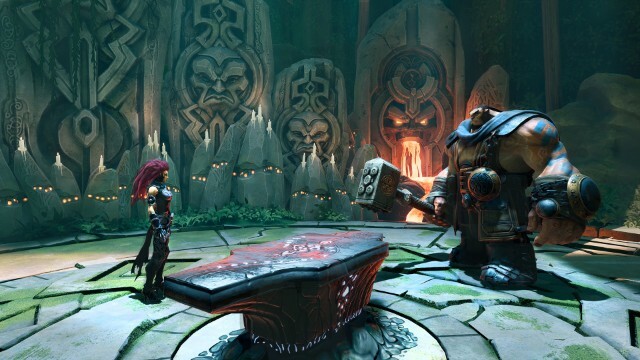 Darksiders 3 starts with Fury, the third horseman, and one with the lowest stature, being summoned by the Charred Council: keepers of balance in the universe. As the hero of the original Darksiders, War, is in shackles and faces judgement for his alleged misdeeds, Fury is tasked with ridding the Earth of the seven deadly sins. In exchange, she demands to become the unquestionable leader of the horsemen, to which the council agrees. Accompanied by a mysterious female watcher, Fury sets out to Earth – or rather, what remains of it – where her arduous quest begins. Fury is brilliantly voiced by actress Cissy Jones, whom you might recognize by her roles as Delilah in Firewatch, or Joyce in Life Is Strange, among many others. Ms Jones does an excellent job at portraying Fury as an arrogant and ruthless horseman but doesn’t shy away from revealing her more vulnerable and caring side on occasion. Unlike Death from Darksiders 2, Fury bears little sympathy towards her brethren and has a particular disdain towards humans. On the contrary, her dialogue is often filled with some witty sarcasm, but while undoubtedly amusing, feels somewhat forced and too similar to Death’s own dark humour. It’s a shame that most of the other characters in Darksiders 3, aside from a select few, lack personality and are easily forgettable. Hence, even though she’s not perfect, Fury takes most of the metaphorical cake to herself. Upon arrival on Earth, Fury’s first goal is to track down Envy and dispose of her. 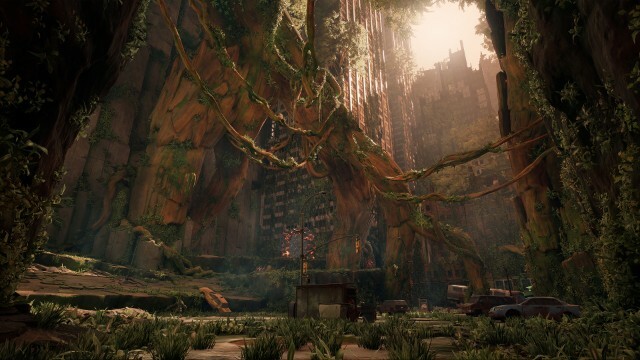 The world itself is in ruins; abandoned cars line the streets, parts of the roads are gone, crumbling skyscrapers are barely still standing and most of the city is overgrown with vegetation. Some vistas are indeed gorgeous, with vast ruins of a long-gone metropolis being covered by bright rays of the sun. Many other locations lack this artistic appeal; subways and underground cave systems seem drab and dull in comparison. Worst of all, much of your time will be spent exploring the latter. In both cases, however, you will often encounter inaccessible pathways or ledges barely beyond reach. Fury will require additional abilities to gain access to these areas and claim the rewards that they hold. Certain items can often be seen far off in the distance and attribute scope to environments. Along the way, and as you progress, you will also discover shortcuts, which make the world feel more connected and whole. Puzzles, on the other hand, are scarce and disappointingly straightforward. Most of them revolve around: “figure out how to bring this explosive bug to the cracked wall, without it blowing up in your hand”. The initial segment with Envy acts as a tutorial; it introduces basic combat mechanics and an assortment of relatively weak enemies. Combat is similar to previous entries, seemingly simple, yet surprisingly tough and rewarding. Fury is equipped with a whip which gains additional variations as you progress through the story. Most attacks are performed with a single button, while more complex combos require either holding the attack button or a delay between each press. This simplicity creates intuitive and diverse combat, without forcing you to memorize a number of different button combinations. Its difficulty stems from a simple fact that many enemies are incredibly tough and can kill Fury, often with a few hits. Incoming attacks can be dodged and this is where combat becomes rewarding. If Fury dodges at just the correct moment, time slows down temporarily, which indicates that an evade counter can be performed. Attacking after a successful evasion makes Fury leap at her target, dealing more damage and often staggering it as well. It takes time to master but makes you feel like a total badass when successfully dodging multiple hits in a row. Each defeated enemy bestows souls upon Fury; blue souls are used as a currency and for levelling up, green souls replenish her Nephilim’s Respite, and yellow souls fill her Wrath gauge. Instead of being directly healed by the green souls, Fury incorporates the Nephilim’s Respite which, when used, replenishes a certain amount of her health. It’s similar to the Estus Flask from the Souls games and has an intentionally delayed animation. There are other healing items in the game, but their numbers are limited and they require a cooldown period after use. A feature I found out of place is that, upon dying, any items used after the last checkpoint are lost. Blue souls are also lost when falling in battle, but can be recovered later on. At certain intervals during the plot, Fury will gain additional powers: Hollows. With a full Wrath gauge, Fury can perform a special attack depending on the currently equipped Hollow. In addition to altering her visual appearance (mostly hair colour), each Hollow grants a unique secondary weapon. These are imbued with a particular elemental power and have a separate combo list. 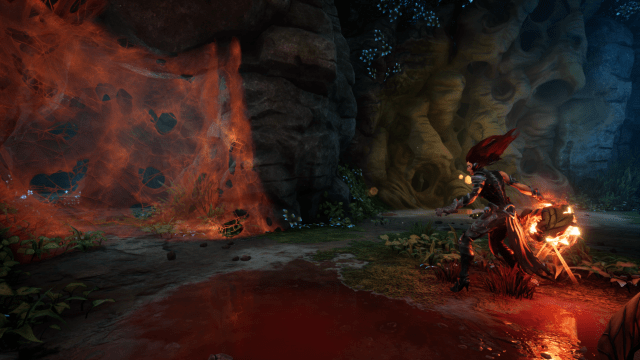 Moreover, other abilities for accessing and traversing previously inaccessible environments, like a triple jump, will become available along with the acquired Hollow. Among Fury’s numerous abilities is also the Havoc mode, the gauge for which is gradually generated during combat. Once activated, Fury transforms into an enormous, invincible demonic version of herself, deals a lot more damage and slowly regenerates health. Combat does have its shortcomings, however. Fury can lock-on to a single target, which make one-on-one battles strategic and fun. Switching between multiple opponents, especially when there’s more than two – isn’t fun. Enemies often approach from several directions and changing your preferred target can be a challenge. It’s even more difficult to retaliate against enemies approaching from behind, as perspective can’t be changed quick enough. There are attacks with a wide radius for such situations, but they often miss, and when that happens Fury is left completely vulnerable. Collected blue souls can be traded to merchant Vulgrim, who also acts as a checkpoint, for either obtaining attribute points, items, or enhancements. Attribute points can then be spent on upgrading Health, Attack, and Arcane. While the former two are quite self-explanatory, Arcane improves power when dealing damage via evasion, Havoc, and Wrath attacks. Unfortunately, there are no exciting skill trees to develop this time around. Early on in the game, Fury will also meet blacksmith Ulthane, who will not only task her with finding the remaining humans on Earth but also improve her weapons and enhancements. Upgrades require ore found during exploration, but are very much worth it, and even necessary to progress. Enhancements are particularly interesting, as they can be inserted into any weapon, granting it additional properties, as well as a constant buff to Fury’s abilities, so long as they remain equipped. After defeating Envy and collecting its power, Fury can track down the remaining sins via a compass at the top of the screen. 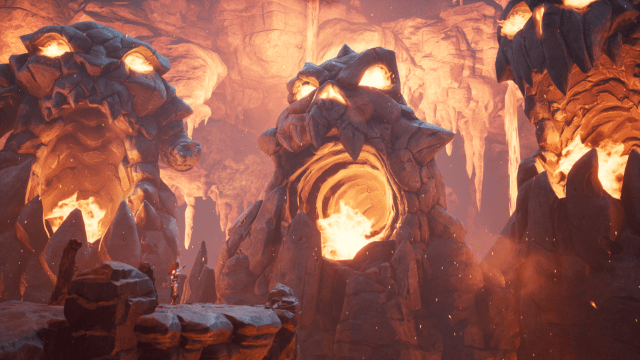 By this, Darksiders 3 creates a deceptive impression of free exploration, yet I still felt that the order of sins was already predetermined and my progress – linear. Each physical manifestation of sin is quite accurately portrayed: Envy is represented as an ugly crone, Wrath is a brainless brute, and Sloth… well, let’s just say that he hasn’t renewed his gym membership in a while. As you can see, bosses are not lacking in the diversity department, and are also fun and challenging to battle against. It can’t be said about regular enemies, however, as most of them don’t possess any distinguishing features and are simply boring. Most checkpoints – wherever Vulgrim is – are located in a relatively close proximity, but still far enough to incentivize you doing your best during each pivotal encounter. I say “most”, because some of them are unusually far in relation to others, forcing you to cover a substantial distance to reach the boss room once again. There’s one particularly irritating enemy, however, which I couldn’t defeat no matter how many times I tried: the loading screen. Now, when we have humongous, almost seamless games like The Witcher 3 and, more recently, Red Dead Redemption 2, loading screens seem vastly outdated. That said, I don’t mind for a game to load its resources once in a while, but Darksiders 3 seems to do it at every given opportunity. During gameplay, it’s not even a loading screen, the game just freezes Fury in her tracks and a loading icon appears at the bottom corner of the screen. You walk for a bit, the game loads, you walk for yet another bit, guess what – the game loads! It’s not uncommon for this to happen multiple times during the span of a mere 30 seconds. Arguably, it’s even worse upon dying, as it often takes up to a whole minute before you can return to action. I enjoy the Darksiders series for being Darksiders; a colourful fantasy world with a satisfying hack and slash combat, a cast of bizarre characters, and a galore of environmental puzzles. Darksiders 3 tries too much to be something else: to be dark and tough. As a result, it loses a lot of its own identity – its own unique charm. It’s by no means a bad game and certainly has its moments, but being disappointed myself, I just can’t wholeheartedly recommend it to existing fans of the franchise. For me, Darksiders 3 is like a girl that I’m not immediately attracted to but fall more and more in love with, as I become acquainted with her intricacies. Afterwards, I come across some of her glaring flaws and the previously warm sensations begin to dissipate. I loved the challenging nature of combat, upgrading my arsenal to face stronger foes, as well as certain aspects of exploration. Ultimately though, my experience was marred by a number of intrusive loading screens, a lacklustre cast of characters and a bland, featureless world. I truly want to love Darksiders 3, especially after playing the second game, but it simply fails to deliver upon set expectations. Fury, as fiery as she is, managed to light my fire, but alas, the flame was promptly put out.